Barça defeat Sevilla 4-2 but lose Messi for 3 weeks. 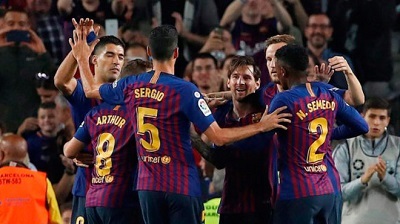 FC Barcelona’s four game league winless streak came to a halt following their 4-2 victory over Sevilla at the Camp Nou in a clash over first place in the standings. The win came with a cost as Lionel Messi suffered and had to leave the game after 26 minutes. Messi set up Coutinho to opening the scoring after just two minutes before Messi scored ten minutes later to make it 2-0. Unfortunately, he then suffered an injury after falling on his arm awkwardly. Barça though did not collapse without their leader and extended their lead to 30-0 in the 63rd minute when Suárez converted from the spot after being brought down by Sevilla’s keeper, Vaclik. The Blaugrana though were not successful in keeping a clean sheet and Sevilla pulled one back from Pablo Sarabia’s deflected shot. Barça would score one more goal in the 88th minute courtesy of a Rakitic volley and Sevilla would their second and final goal of the game when Luis Muriel scored in stoppage time. This result meant that Barça are league leaders again. They will now have to shift their attention to the Champions League stage when they host Inter on Wednesday before hosting arch enemy Real Madrid on Saturday. Unfortunately, Messi will not be participating after the club officially announced that Messi has a fracture of the radial bone in his right arm and will be out for approximately three weeks. Sevilla FC: Vaclik, Carriço, Kjaer (Mercado, 55′), Sergi Gómez, Jesus Navas, Arana, Sarabia, Banega, Franco Vázquez (Roque Mesa, 69′), Ben Yeder & André Silva (Muriel, 78′). Goals: 1-0 Coutinho (2′); Messi; 2-0 Messi (13′); 3-0 Suárez (63′ – penalty); 3-1 Sarabia (79′); 4-1 Rakitic (88′); 4-2 Muriel (90+1). Previous PostBarça struggle again with 1-1 draw to Valencia. Next PostTime for Barça To Step Up.